Grantbook works in the world of technology and as a result, we are often asked to focus on the inert and inanimate. Can a system produce a specific report? Can a system have invite-only applications? Can a system have audit trails by field? However, across 200+ projects now (and almost 12,000+ working hours), we've seen pain points that cannot be captured in or solved by a user story, a report or a dashboard design, something we’ve dubbed: organizational heartache. 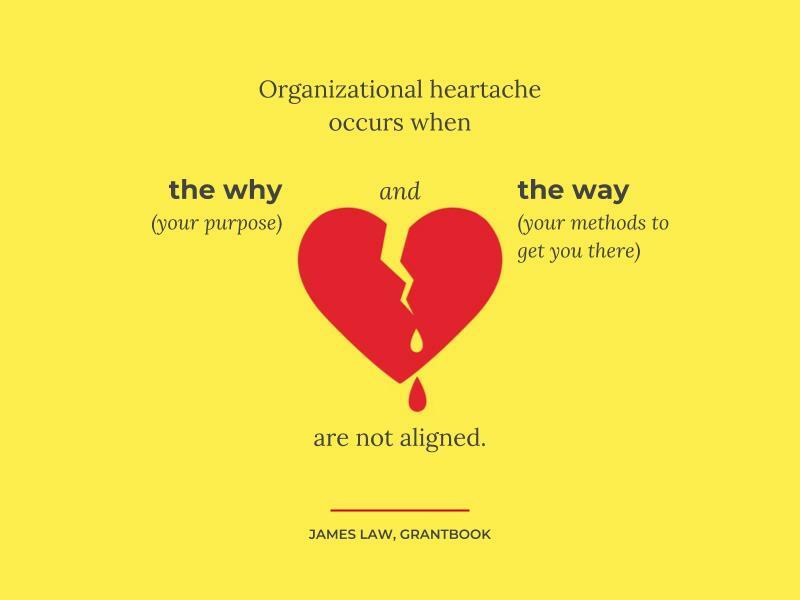 ‍Though it manifests in many different ways, at its core, organizational heartache occurs when the why (your purpose) and the way (your methods to get you there) are not aligned, creating frustration and burnout. In some foundations, this might show up as an overbuilt application form, forcing applicants to provide a mountain of information that then creates anxiety for the Program Officer who must review that data. In others, it shows up in the post-award process, with both grantees and grantors asking: seriously, just how many touch-points, check-ins and interim reports are enough? Flow is that perfect state between boredom and frustration where we find ourselves practicing our craft joyfully. 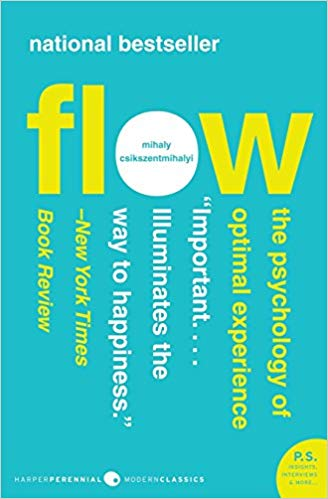 One of Grantbook's key influences is the book Flow by Mihalyi Csikszentmihalyi. Though published almost 30 years ago now, the research is still incredibly relevant today. Briefly defined, Flow is that perfect state between boredom and frustration where we find ourselves practicing our craft joyfully. We all know those moments in our lives when we're playing sports, solving puzzles or creating art, when things just seem to work and frustration dissipates. Flow is what it feels like to find joy in work. Flow, in my opinion, is the antidote to organizational heartache. 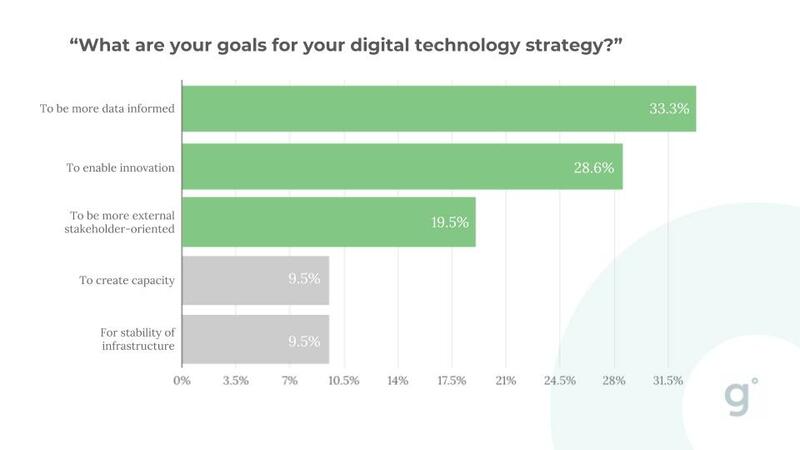 In 2018, Grantbook saw foundations prioritizing three key areas of their digital strategies. Instead of focusing on the more traditional benefits of technology like efficiency and permissions control, we saw more and more clients pursuing technology to elevate and embody their mission: gathering more data (“data informed”), trying fresh ways of granting (“enabling innovation”), and being more open to Grantee needs (“external stakeholder oriented”). These shifts, in my opinion, begin to redress the misalignment of mission and method that both leaves philanthropy teams frustrated, and reflects grantmakers’ deep desire to recover Flow in their work. While these shifts do indeed offer glimmers of optimism, there are some other trends leading philanthropy out of Flow, pulling its ways further and further from its why. Why do we focus so heavily on data, efficiency, and results -- frameworks from more commercial spaces like product companies and innovation firms -- to demonstrate legitimacy, progress and value? Whether it is a dashboard design exercise, a process reengineering project or a data strategy, our conversations with grantmakers tend to follow a similar path. They start with the airing of familiar frustrations about things not working and quickly move to intellectual exercises about new solutions to make things better. Then, just when we are getting started, anxiety rushes in, forcing those in the room to temper their ambitions. This cycle of new energy, ideation and then dejection is exhausting. I’ve seen it time and time again. Previously, it was about reducing the amount of administrative time spent in the grantmaking process or increasing security into a permissions nightmare. More recently, the cycles circle around collecting more data to measure impact and innovation to meet standards set by crowd-funding or online banking. Common to all of these examples is an attempt to professionalize philanthropy to meet the expectations set by other sectors. Why do we focus so heavily on data, efficiency, and results -- frameworks from more commercial spaces like product companies and innovation firms -- to demonstrate legitimacy, progress and value? This constant looking to sectors with very different goals and drivers, can result in high anxiety and constant second-guessing. We are a clearly a sector in need of new, more fitting, tropes and paradigms. Most foundations work on problems in complex systems where there is no single solution or identifiable single change agent. In addition, the problems philanthropy is trying to solve move constantly, making even current state assessments difficult. So asking grantmakers and foundation staff to collect massive amounts of data, provide a snapshot on the how a problem has shifted, and spell out succinctly how funds have made a difference, is a tall order and one that is frankly, unachievable. To get to a Flow state, unimpeded by physical and emotional distractions, most people need their values (e.g. impact, social good, etc.) and achievable goals to guide them. 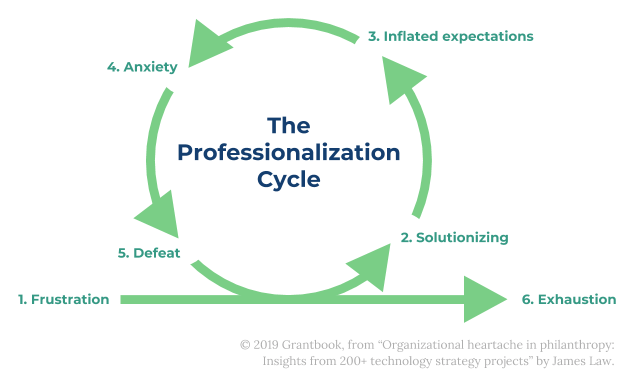 From the many interviews I have conducted, the professionalization of philanthropy introduces unachievable goals to so many foundations, making reaching Flow more and more difficult. At best, fed up with the pursuit of unrealistic promises of the latest tech project, teams simply resign themselves to status quo. At worst there is attrition: tired of shuffling the deck chairs on the Titanic, people jump ship, resulting in devastating impact on organizational memory and goodwill. To break this cycle, we need to examine our insecurities. 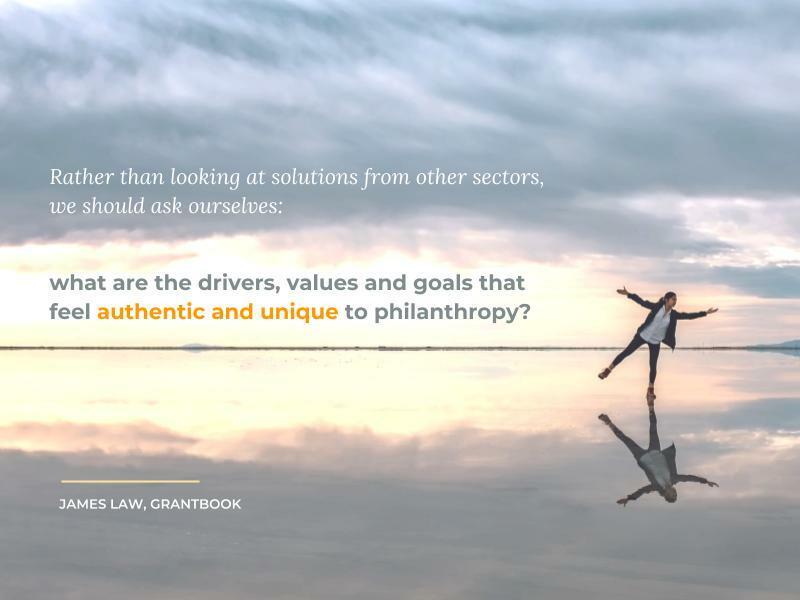 Rather than looking at solutions from other sectors, we should ask ourselves: what are the drivers, values and goals that feel authentic and unique to philanthropy? We need to be open and honest about philanthropy’s purpose, and use that to create new practices. Just as the role of grants management has shifted from procedural to principled in the past twenty years, letting philanthropy’s purpose guide its practices can help the sector as a whole find Flow. Philanthropy has been investing in building cognitive trust for a while now. We have impact frameworks, indicators and evaluation methods galore. I believe that if we double down on building relationships and mutual understanding, we can find Flow in our sector, a way of working not beholden to the tyranny of value and metrics. Affective trust includes all those "softer" factors of relationships and reputation, those unspoken and unquantifiable indicators that drive our instincts and let us know how well we are aligned with others at the gut level. What I have heard consistently across efforts to become more stakeholder engaged, more innovative or more data-informed this past year, is that those who work in sector want to deeply know and trust the very people doing the work, and want to use this knowledge to inform how to allocate resources in support. In this way, true empathy becomes the barometer of success, not just efficiency and effectiveness. The movement to build affective trust is already starting. You can see this shift reflected in consumer behaviour and the technology consumers are selecting. According to Gartner, CRM (constituent relationship management) software became the largest software market in 2017 and has a positive outlook until 2022. In our sector, TAG's 2018 State of Philanthropy tech report, CRM is the growing reason Foundation use grants management technology. PEAK Grantmaking's recent report on the Grants Management role suggests that Foundations hire more for empathy and relationship-building than administration and process management. Products and services are also rapidly evolving to meet these demands: Fluxx has been improving its Grantseeker product, Foundant its Granthub product and Guidestar, their G4G service. Foundations and grantmakers now have more options than ever to collect, curate and share data relationship data with themselves and each other, building a complete picture of what it means to “know” a Grantee. Even a CRM company like Copper is so bold as to claim that we are now in the relationship era. Foundations and grantmakers now have more options than ever to collect, curate and share data relationship data with themselves and each other, building a complete picture of what it means to “know” a Grantee. These indicators provide excitement around the potential for many grantmakers to realign the why and the way in their organizations; to bring together practice and purpose; and ultimately to find Flow in their work. However, this budding direction must be nurtured carefully to avoid the pitfalls we have seen before. Philanthropy, as a people-focused sector has so much to offer to the art of building relationships. Yes, much can be gleaned from the research behind marketing technology, social media and targeted advertising, and grantmakers do need to better understand how to reconfigure these tools to address philanthropy’s unique values and challenges. However, without careful thinking we risk turning even this pursuit into just another efficiency and technology procurement project that does not fundamentally shift how we work. So, to avoid that fate, I’ve put some thought to a few ways forward, ways that philanthropy can continue to shape its own lens on relationship-building, it’s my hope that some of the paths below can help reduce organizational heartache and will unleash more Flow in philanthropy. More qualitative data gathering and relationship building cannot be done via quantitative means. Investing more in sharing our experiences in the sector more frequently and deeply is vital to managing this mindset shift. Nora Bateson has been investigating warm data as part of complex systems change for many years now. The focus on healing versus hoarding is a key principle to carry over in how philanthropy treats data. While moving from paper to online forms and dashboards has greatly increased efficiency, it does not fundamentally transform how Grantors relate to Grantees. From smart cameras to digital assistants, there are new ways to explore how stakeholders can keep in touch. Marketing technology and marketing automation have enabled corporations to gather heaps of data on who we are, what we want to buy and what makes us buy. It is incredibly good at finding new consumers and igniting demand in their existing customer base. What lessons can philanthropy learn about how to attract and engage constituents we don't yet know. What lesson could philanthropy take from marketing and reinvent to build mutually beneficial relationships between stakeholders? 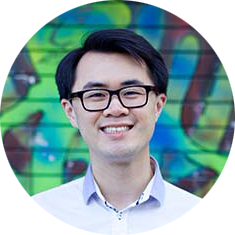 Can we co-opt digital marketing techniques to unite rather than segment? How can we use digital technology help social sector “unicorns” unite? As I mentioned earlier, when philanthropy mimics business, it risks losing what makes it unique. If philanthropy doubles down on relationships, I believe the sector can develop new practices and lessons about working with people that even marketing firms have not grasped. Being able to have business ask what it can learn from philanthropy, would be a fascinating shift.